Most people describe Steven as a leader first; then, as a multi-sport athlete, training hard in a new sport for the 2019 World Games! 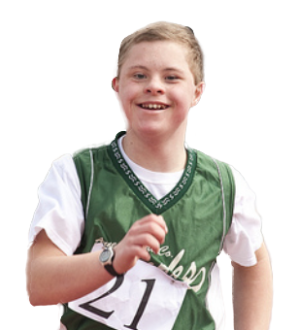 Steven didn’t get involved in sports for the health benefits and exercise; he got into sports to help someone in need. Steven was 20 when he learned that a community member with disabilities was unable to access local church facilities. He decided to take action by helping raise needed money at a kayaking fund-raiser event. One problem: Steven didn't know how to kayak. Steven's mother recalls that, at that point, Steven—who has Asperger syndrome—was not very social. Yet he was passionate about helping others. For the church project, he worked hard to motivate lots of people to get involved and helped raise more than enough money to make the church facilities inclusive for all. He also learned to kayak! That was more than 20 years ago. Since then, Steven has continued to advocate on behalf of those in need. As he puts it, "If you treat everybody with the same dignity and respect, then, you'll make them smile." Steven's community work has earned him Britain's Young Achiever's Award. As part of this honor, he attended a reception at Buckingham Palace. Steven saw the opportunity for a little networking. Soon, Steven was organizing the first Prince's Trust team involving people with disabilities—after asking Prince Charles for permission, of course. Steven has also traveled to Kosovo several times with Smile International to help rebuild homes in war-torn areas, despite his fear of flying. As for sports, Steven has become a gold- and silver-medal winning kayaker in Special Olympics local and international events. The upper-body training needed for kayaking strength also led him into powerlifting. The 2019 Special Olympics World Games in Abu Dhabi will mark the first time Steven will compete in power-lifting at the international level. He says he’s ready!! Steven is a proud leader in The Revolution Is Inclusion.